Click HERE for tickets and registration! Click HERE to become an individual or organizational sponsor! You are warmly invited for an evening of community, music, and inspiration at the Kaleo Center for Faith, Justice & Social Transformation’s annual celebration – Night of a New Day! 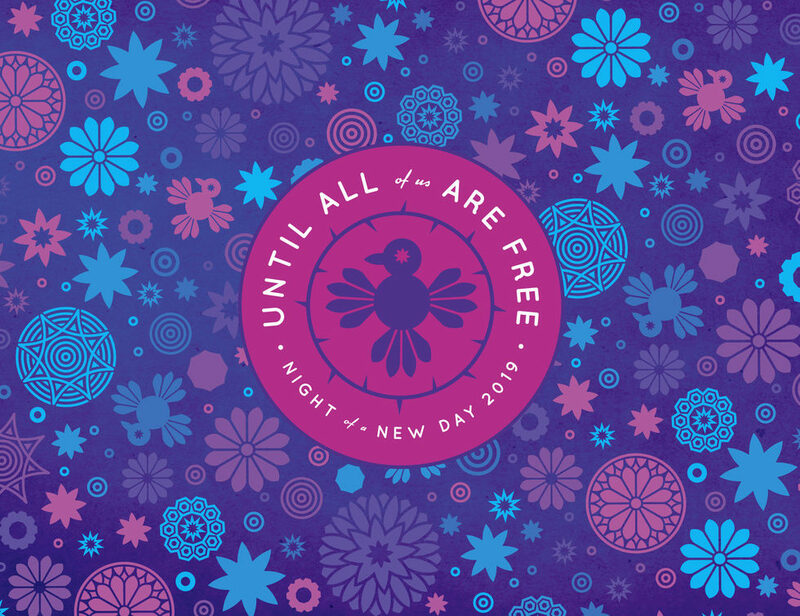 This year’s theme, “Until All of Us are Free”, speaks to a moment of deep complexity, faith, and solidarity in our shared movements for justice and liberation. It speaks to our varied traditions of finding hope in struggle, of finding love in uncertainty, and in finding interconnectedness when we need it most. We are thrilled to welcome Yavilah McCoy as our as our keynote speaker for 2019. Yavilah is a nationally renowned educator, organizer, and spiritual leader who draws on her inheritances of Blackness and Jewishness to speak powerfully to the ways that racism, anti-Blackness, Islamophobia, and anti-Semitism shape our lives, and to the ways that transformational movement making can build the world that we most dearly imagine. Sliding scale registration starts at $0, out of our belief that a celebration should be truly open to community. Enjoy a special dinner of Indigenous foods by The Sioux Chef, music by The Lacewings, poetry by See More Perspective, and more. Children are welcome, and we hope that you will bring your family and friends! Kaleo Center relies on the generosity and support of our donors to make our work in the world possible. We are able to act boldly towards justice because each of you. Tickets for Night of a New Day are sliding scale. As you go though registration, you will find suggested amounts. If you don’t see an amount that works for you, or if you’d like to make an additional gift, simply visit our DONATE page to customize an amount that feels personally meaningful. If you would like to give by check, write your check out to United Theological Seminary (our fiscal sponsor), and note Kaleo Center on the memo line. Mail to: Kaleo Center (c/o United Theological Seminary), 767 Eustis St., Suite 140, Saint Paul, MN 55114. Kaleo’s work exists because we are supported by a community of organizers, spirit-seekers, movement-makers, and people from across diverse faith traditions who know – none of us can do this alone. Doing work at the edge of reparations and shared liberation doesn’t always lead to easy funding streams. For years, our sponsors and donors have reversed that logic. As organizational and individual sponsors, you have traveled with us, pushing us, enlivening us, and giving in ways that truly look like community. Kaleo Center relies on Night of a New Day to fund almost all of our community work for the year, and our individual and organizational sponsors provide the most significant piece of that support. When you become a sponsor, you become part of the Kaleo family, and you become part of creating new conditions of possibility towards a more just and loving world. Individual and organizational sponsors receive recognition at the event and in our outreach materials, advertising in our program, public thanks in our social media campaign, and our profound gratitude. You are also warmly encouraged to act as an ambassador for the event – inviting your friends, guests, and networks to register for free, and spreading the word in ways that encourage new folks to enjoy and attend. You are more than welcome to give a different amount. Simply email Liz Loeb, Associate Director of Kaleo Center at Liz@kaleo.center. If you would like to give by check, write your check out to United Theological Seminary (our fiscal sponsor), and note Kaleo Center on the memo line. Mail to: Kaleo Center (c/o United Theological Seminary) 767 Eustis St., Suite 140, Saint Paul, MN 55114. Yavilah McCoy is a renowned speaker, educator, and spiritual practitioner. Raised in an Orthodox family, McCoy’s work explores the complexity of her tradition, her inheritance a Black Jewish women, and the ways that we can all multiple commitments towards justice. As the founder of Ayecha, Yavilah created one of the first organizations in the U.S. that provided Jewish diversity education and advocacy for Jews of color in the United States. As an anti-racism activist with a national platform, she has provided training and consulting to numerous social justice projects that span multiple faith identities and faith communities. In 2009 Yavilah co-wrote and performed The Colors of Water, a Jewish gospel musical describing the matriarchal journey of four generations of her African-American Jewish family. In 2014 she established Dimensions Educational Consulting, through which she continues to support organizations in expanding their relationships across race, religion, identity and culture. Yavilah serves on the steering committee of the national Women’s March, and has been a core part of many large-scale national movement teams, bringing a uniquely intersectional perspective to the ongoing work of racial justice and collective liberation. Kaleo Center for Faith, Justice & Social Transformation offers a home for movement-building where our spiritual practices meet our work for justice and where our work for justice meets our diverse faith traditions. We nourish relationships that honor and include our full spiritual selves. We convene spaces that invest in community across tradition and belief, and we organize with that community to take public action towards collective liberation. We organize people across diverse faith traditions and communities of spiritual practice to act in meaningful solidarity with front-line local and national organizing for justice and liberation. We work in multiple settings to train leaders across diverse faith traditions and communities of spiritual practice in practices of community organizing and social transformation. We convene a national field of social transformation within seminary education that fosters innovation and creativity for a new generation of spiritually-grounded movement makers. Thank you so much for joining us at Night of a New Day, and thank you so much for continuing to make our work possible with your love and support.